anvilfire.com Detail Images : The Craft of the Japanese Sword Oriental Box bellows. This drawing has been reproduced in many places on the web. This is not the only box bellows design, but it is one of the simplest. 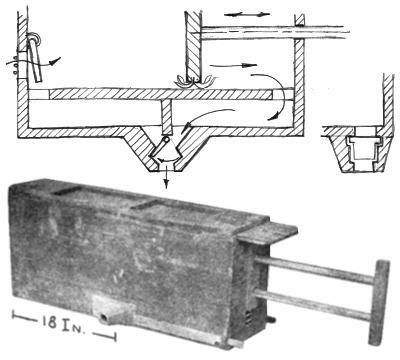 Box bellows are also round cylinders and boxes with the valves built into bottom so that they are a clean rectangular design without the ugly "bird house" manifold on the side of the box. Many served as a tool tote and work bench. Auxiliary features included drawers, file hangers for Chinese method filing, hangers for itinerant craftsmen to carry on a yoke. LEFT: Chinese brass worker's bellows with file guide, clamp staple, drawer and yoke hanger. 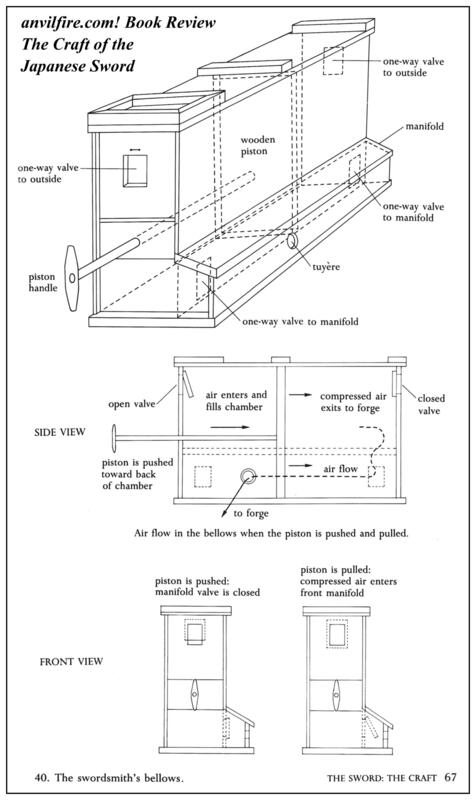 ABOVE: Chinese blacksmiths bellows and diagram. Piston with feather seals, exhaust flip valve. Above are two Chinese bellows. Both have switching exhaust valves built into the bottom. This requires 3 valves rather than 4. The blacksmiths bellows to the right has exhaust ports (tuyere's) on both sides with sliding valves to change from left to right. The intakes are covered with heavy steel wires to prevent mice from getting into the bellows and eating the feather seals or building nests inside. 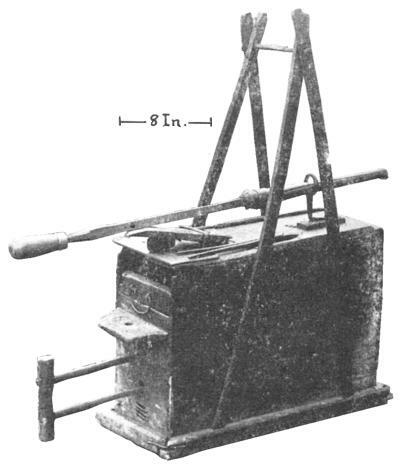 The bellows with the yoke hanger would have a matching tool chest (or bundle of tools) which would contain a small anvil, tools and materials. The two would be loaded to balance on the shoulder yoke. Thus the itinerant craftsman could carry all the tools of his trade wherever he went. Chinese Workholding Bench and "Sen"